T206 Joe Doyle N.Y. "Nat'l" Hands Above Head pose, is thought to be rarer than some of its more famous counterparts from the same classic T206 set, Honus Wagner, Eddie Plank and Sherry Magie. Most experts agree there are fewer than half dozen of Doyles' with the "Nat'l" designation. No one has sufficiently explained the reason why such variation is so scarce. Does Doyle N.Y. "Nat'l" variation really exist? 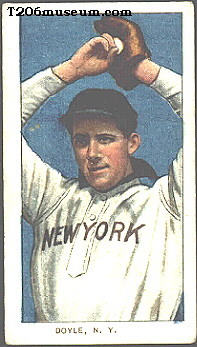 One of the leading grading company SGC, Sports-card Guaranty Corp., known as the most knowledgable vintage cards grading company graded a rare variation of T206 Joe Doyle N.Y. Nat'l. After such card sold to Keith Olbermann, one of the T206 set experts/collectors, in Mr. Mint's auction and Keith confirming the card is fake. 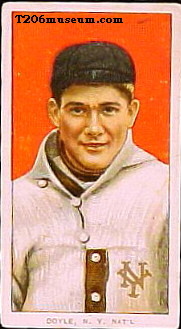 One of the PSA authorized dealers, 707 Sportscards, purchased a T206 Doyle Nat'l specimen from a collector in 1999. That specimen was deemed and slabbed authentic by PSA at SportsFest, but didn't receive a grade on the label because PSA officials felt it had been trimmed on the top. However, unless you have special relationship with PSA, it is unusual that PSA would slab a card which has evidence of alteration. Is that Doyle Nat'l card only has trimming problem or it has been alterated as well? T206s were manufactured in 1909-1911, since then, it has been circulated in the market close to a century. In 1980, the first Joe Doyle N.Y. Nat'l (Hands Above Head) variation specimen was discovered. The discoverer kept such discovery as a secret and attempted to look for additional specimens. According to most vintage card collectors, T206s consider as the most popular tobacco set has ever produced. If this is the case, what is the reason why such variation has been hidden for 70+ years until the first specimen appeared in the market? 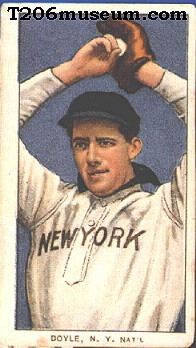 There are four different versions of Doyle cards in the T206 set. 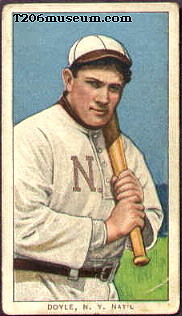 One of them is Joe Doyle and the other three are Larry Doyle (Portrait, Throwing, with Bat). It seems like the "Nat'l" designation on those rare Joe Doyle specimens appear to be slanted. 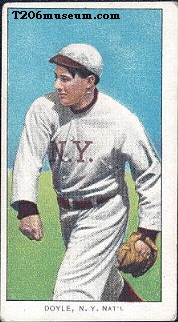 Ironically, none of the other Doyle (Larry Doyle) versions and all other T206s has such weird printing.